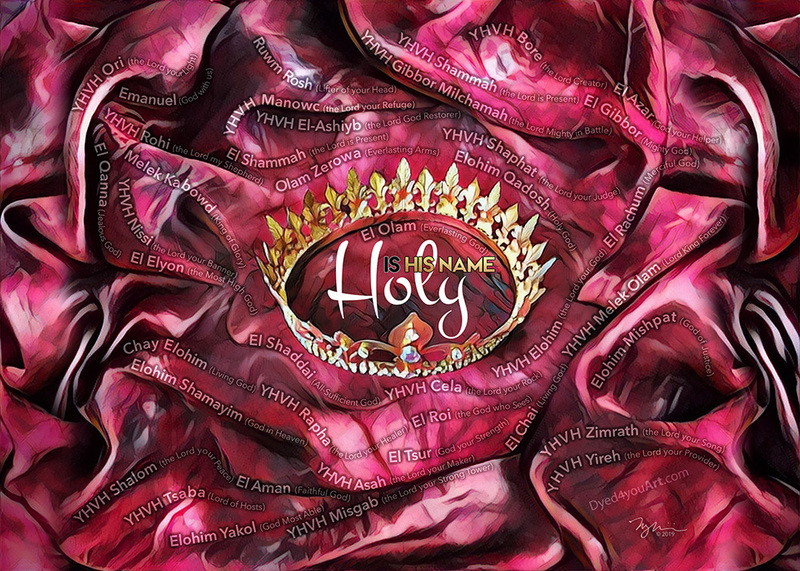 Holy is His Name reminds of the many facets of God’s character (which we find in His names), and it encourages us to meditate on each of them in our quest to know Him more. Acts 2:21 (VOICE) And everyone who calls on the name of the Lord will be liberated into God’s freedom and peace. Psalm 105:1-4 (NIV) Give praise to the Lord, proclaim his name; make known among the nations what he has done. Sing to him, sing praise to him; tell of all his wonderful acts. Glory in his holy name; let the hearts of those who seek the Lord rejoice. Look to the Lord and his strength; seek his face always. Proverbs 18:10 (GW) The name of the Lord is a strong tower. A righteous person runs to it and is safe. Beloved, those who know Me, know My name. My name reflects My character. A part of intimacy is having a deep assurance about another’s character that is unshakable regardless of circumstance. Having that foundation with Me brings an enormous amount of peace. If you know Me, you know I AM always with you. If you know Me, you know I take care of My children. If you know Me, you know I’ll use each hardship you encounter as a force for good. Knowing Me is about trusting and releasing control into My hands. It’s about allowing Me to be your strong tower and your firm foundation. So, beloved, run to Me and be safe. Psalm 105:1 (AMP) O give thanks to the Lord, call upon His name; Make known His deeds among the people. Beloved, you know My name, and you’re well familiar with My nature. Will you tell the world who I AM? Give thanks to Me, and make My deeds known among the nations. Share unashamedly about how I have moved in your life. Testify, beloved. Share the truth of My character, for so many have a skewed and false view of who I AM. It isn’t your job to change their minds, but it is your job not to hold back from speaking truth – the truth of who I AM, how I move, and the power of My love. 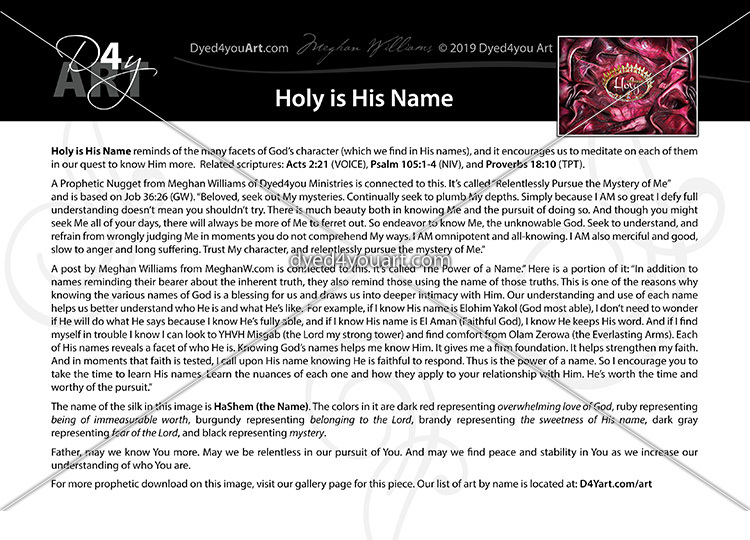 As I’ve been researching the various names of God for the Dyed4you Art piece called “Holy is His Name,” God has been highlighting to me the power a name holds. Each time someone says a name, they are declaring something over that person. Though we may not recognize that culturally, it doesn’t make the principle any less true. Years ago, Papa transitioned me from the regular use of a nickname (Meg meaning “a crash, brash woman”) to my full given name (Meghan meaning “great mighty one”). He used this change to close a door on a season of my life that was past and to reemphasize the true call He has for me (I share the story in my post “Meghan vs Meg: What’s in a name?”). This was a powerful reminder to me that I am different than I was. It drew a line that marked the old season passed, and none of the baggage need be dragged on. In scripture we see this same principle in action. To name a few, Abram was changed to Abraham (Genesis 17:5), Sarai was changed to Sarah (Genesis 17:15), and Jacob was renamed Israel (Genesis 32:28). In each of these instances, God is declaring something new over these individuals. And He does the same with us today if we’ll listen. In addition to names reminding their bearer about the inherent truth, they also remind those using the name of those truths. This is one of the reasons why knowing the various names of God is a blessing for us and draws us into deeper intimacy with Him. Our understanding and use of each name helps us better understand who He is and what He’s like. For example, if I know His name is Elohim Yakol (God most able), I don’t need to wonder if He will do what He says because I know He’s fully able, and if I know His name is El Aman (Faithful God), I know He keeps His word. And if I find myself in trouble I know I can look to YHVH Misgab (the Lord my strong tower) and find comfort from Olam Zerowa (the Everlasting Arms). Each of His names reveals a facet of who He is. Knowing God’s names helps me know Him. It gives me a firm foundation. It helps strengthen my faith. And in moments that faith is tested, I call upon His name knowing He is faithful to respond. Thus is the power of a name. So I encourage you to take the time to learn His names. Learn the nuances of each one and how they apply to your relationship with Him. He’s worth the time and worthy of the pursuit. A Meditation of the Word called “The Name” from Elisa Eaton of Waiting in the Wings is connected to this. Exodus 6:3 (NLT) I appeared to Abraham, to Isaac, and to Jacob as El-Shaddai—‘God Almighty’—but I did not reveal my name, Yahweh, to them. In Exodus 6:3, God makes an interesting statement to Moses. He says, “I appeared to Abraham, to Isaac, and to Jacob as El-Shaddai—‘God Almighty’—but I did not reveal my name, Yahweh, to them.” There are Jewish scholars who claim that this Scripture isn’t saying that the forefathers of the faith didn’t know that “Yahweh” was one of God’s many names. Instead, the side of God’s character that the forefathers saw throughout their lives was only El Shaddai—the all-powerful God, their sufficiency and sustainer. However, generations later in Egypt, the children of Israel witnessed the character of God in a way their forefathers did not. Yahweh—whose very name reflects that He is the source of all existence and being—showed His power in a way that completely defied the laws of nature. Whether we realize it or not, God reveals Himself to us through different names at different times. We come to know the many facets of His character through each of these names. Sometimes the “name” family members or brothers and sisters in Christ know God by may not be the same name that we know Him by. We may grow up perceiving the Creator, at first, only as Elohim—God, ruler, and judge of the universe. When we receive salvation, we come to know Him as Haggo’el—the Redeemer. And as the Spirit of Adoption draws us closer to our Creator’s heart, we may come to know God as Abba—our Father. Yet an infinite God has an infinite number of names. And as our life experience transforms, He continues to reveal those names by revealing His character at greater depths. Therefore, it may behoove us to occasionally pause and reflect on God’s interactions with us in different seasons. The Holy Spirit can reveal the name that God is making Himself known by at that time. By inquiring about the name that God is revealing for you at any given time, you will have the opportunity to see who He wants to be in your life now and forevermore. Even more, because God is your Father, it’s important to see how He is imparting aspects of His nature into you. 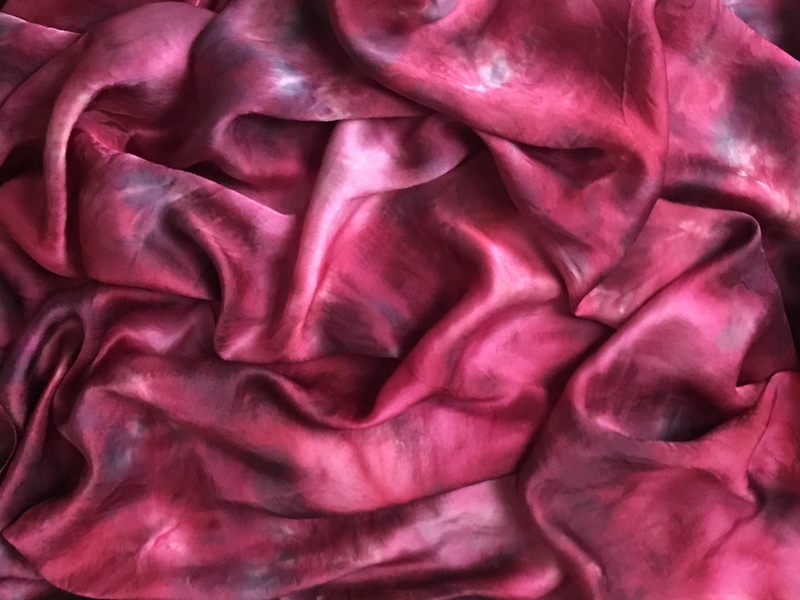 The name of the silk in this image is HaShem (the Name). The colors in it are dark red representing overwhelming love of God, ruby representing being of immeasurable worth, burgundy representing belonging to the Lord, brandy representing the sweetness of His name, dark gray representing fear of the Lord, and black representing mystery. Father, may we know You more. May we be relentless in our pursuit of You. And may we find peace and stability in You as we increase our understanding of who You are.